We’ve been fans of MarketingSherpa reports, guides and handbooks for many years, recently reviewing their SEO Benchmark Report for 2011. As passionate B2B Marketers, we’re always on the lookout for qualitative information to improve our B2B client marketing as well as our own. 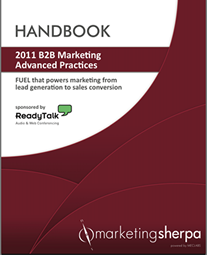 That’s why I’m pretty motivated by the new 2011 B2B Marketing Advanced Practices Handbook from MarketingSherpa. According to MarketingSherpa, the top concerns of B2B Marketers revolve around getting more value and revenue out of limited resources – all in a fast paced world of increasing competition. 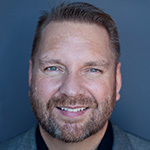 Prioritizing resources for maximum impact is critical and MarketingSherpa has developed a methodology called, FUEL that works as a blueprint for B2B Marketing success. F: Find and attract leads – Strategy to personas to tactical plan. 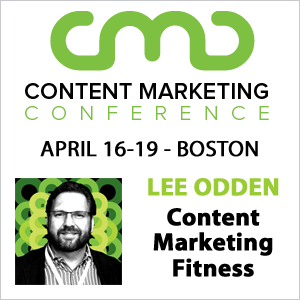 U: Uncover qualified leads – Lead scoring, nurturing and management. E: Establish automated marketing processes – Automate for efficiency and scale. L: Lift results – Continuous improvement and C-Level reporting. MarketingSherpa provides a model for B2B Marketers to determine their maturity level: Trial Phase, Transition Phase and Strategic Phase as a baseline for making strategic changes to improve process and efficiency. In MarketingSherpa’s research, 50% of participants were Strategic, 36% were in Transition and 14% were in Trial with no formal process or guidelines. Effective B2B lead generation involves know which tactics are most effective. 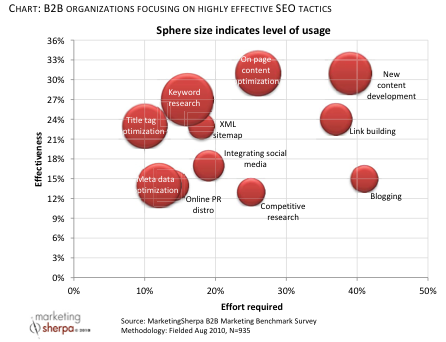 MarketingSherpa’s research shows that websites, webinars, email and SEO are the most effective. Within the area of B2B Search Engine Optimization tactics, the creation of content was rated by MarketingSherpa’s research as the most effective and requiring the most effort. I guess that’s why so many B2B companies hire TopRank 🙂 On page optimization, link building and blogging were also highly rated SEO tactics for their impact. The research data, case studies, screenshots, worksheets and insights provided in this Handbook will require readers to roll up their virtual sleeves and do some honest assessment. But the payoff will be a much more effective program that is worth many multiples of the cost of the report, which is $347 for the pdf version. To get a free preview of the report or for more information and to get a copy, visit the MarketingSherpa site. This MarketingSherpa handbook looks amazing. Definitely looks like it is jammed packed with useful graphs, case studies, etc. Was just looking at Marketing Sherpas site and then saw this article looks like they produce some really valuable information. Does it focus mainly on online marketing or offline as well? This kind of information can affect tens of thousands or multiples of that in sales – if you act on the information. It’s cheap, in my opinion.